In the spirit of the New Year, we’re introducing new weekly themes to the blog! 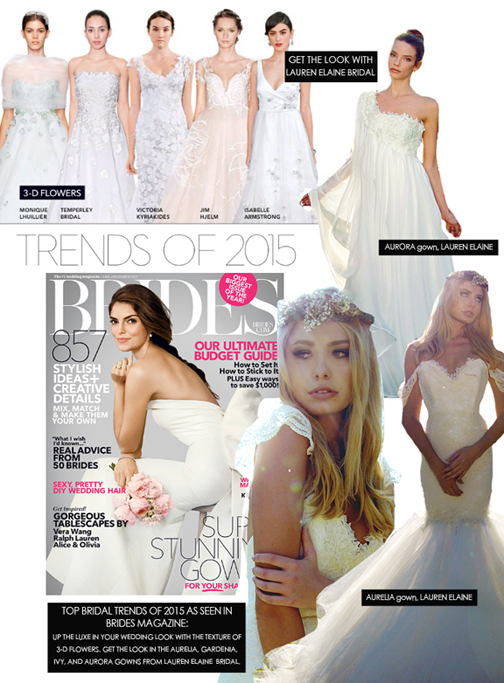 Today, I’m happy to be kicking off ‘Trend Tuesday’ – a weekly post highlighting timely trends in bridal fashion. Today’s trend: 3-D Flowers. As seen in the current issue of Brides Magazine, currently on newsstands, up the luxe in your bridal look with textured flowers. Whether on the neckline, hemline, or even added to a veil or headpiece, texture is always exciting and decadent, and lace flowers keep the effect feminine and touchable.